Mr. Brooks spoke with a Boston police officer in 2012 during a demonstration against scheduled transit fare increases. 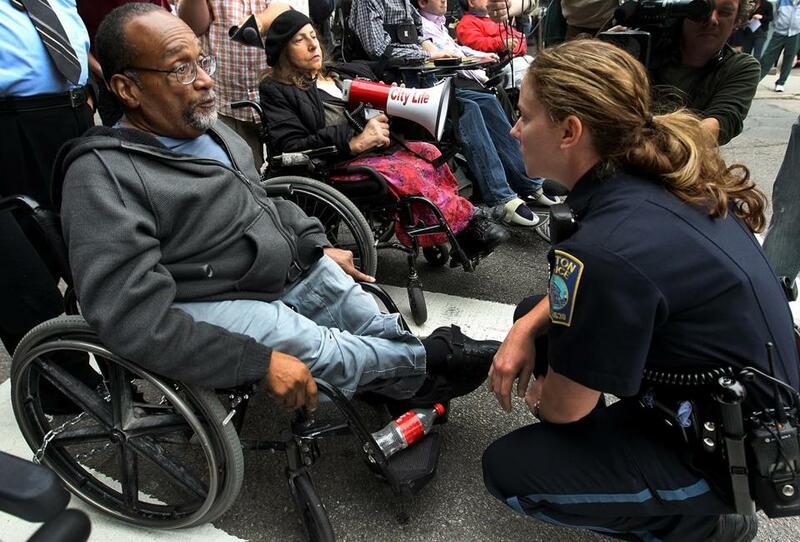 Four years ago, James Brooks helped lead a half-dozen disability activists who chained their wheelchairs together on Beacon Street, blocking traffic in front of the State House to protest steep fare increases for The Ride, which provides door-to-door service for the disabled. Using a wheelchair to get around, and relying on his unfettered spirit to bring him beyond barriers that block the way of those who can’t walk, Mr. Brooks lived on his own terms as he worked for decades to expand access to the disabled in Greater Boston. His health failing, he died April 25 in St. Elizabeth’s Medical Center in Brighton, when he was no longer able to take fluids or food. He was 70 and in his final days friends made sure his room was filled with recordings of jazz that had given him musical sustenance through the years. 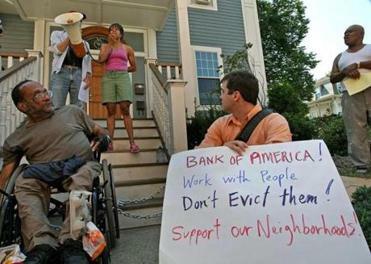 James Brooks was at a protest in Roxbury in July 2008 against an eviction. Mr. Brooks left no family and those close to him held off seeking public coverage of his death for a few weeks until they could notify his extended circle of friends, some of whom, because of their disabilities, don’t own computers. 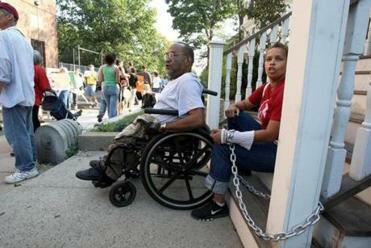 A former head of Boston’s disabilities commission, Mr. Brooks was a founder in the late 1970s of the Disabled Peoples Liberation Front, an advocacy organization. His politics didn’t stop at his wheelchair, however. Mr. Brooks also participated in other advocacy groups and demonstrated on behalf of rights for women and for the LGBTQ community. Interested as much in raising awareness as he was in specific protests, Mr. Brooks was “very soft-spoken and a very gentle person, but he had very strong opinions about political issues,” said Karen Schneiderman, an activist and friend who was the health proxy for Mr. Brooks. Born in Chicago, Mr. Brooks had used a wheelchair nearly all his life. James Brooks was at another protest at that same location in September 2008. Soledad Lawrence chained herself to the stoop. After the theater chain installed a ramp at its Beacon Hill location, Mr. Brooks noted that access to all parts of the building was essential. “Getting in is fine, except if you want to go to the bathroom,” he said. In more recent years, Mr. Brooks staffed the phones in the City Life/Vida Urbana offices, and on occasion chained himself to the railings of houses to try to prevent landlords from evicting tenants. “Up until he died he was defending people from being thrown out of their houses,” Shea said. At City Life’s mass meetings on Tuesdays, Mr. Brooks reminded all who arrived that all were welcome. “Jim would say, ‘Leave your shame at the door, there’s no room for it here. This is where you come to get your voice back,’ and people would get their voices back,” Meacham said. For more than 35 years, Mr. Brooks was joined in his advocacy by his companion, Jean Wassell, whose activist resume was as deep as his in her support of housing, disability, and LGBTQ rights – often through civil disobedience demonstrations. Wassell, who died in 2012, and Mr. Brooks also were devoted fans of the Red Sox and Celtics. Friends of Mr. Brooks will hold a memorial service for Jim Brooks at 3 p.m. July 24 in the SEIU 32BJ offices on West Street in downtown Boston, a site that is wheelchair accessible. When housing advocates met regularly several years ago to try to prevent foreclosures, Mr. Brooks would lead the dozens present at each gathering in a chant. “He would ask the crowd, ‘What do you do when the banks attack?’ And the answer was supposed to be, ‘Stand up, fight back,’ and when you said ‘stand up,’ you were supposed to stand up,” Meacham said.